If you didn't get farther than Hillary literally breaking a glass ceiling this week, you probably didn't make the cut. And the comparatively no-drama DNC convention probably made everyone's work a little harder: About the only conflict was generated by the Bernie Dead-Enders, and they're beginning to wear out their p3 welcome anyway. No one – except for Tim Eagan, below – really seemed to have a good handle so far on the Trump-Putin connection as it's beginning to spill out into the daylight. Today's toons were selected by the dreaded 13th Directorate of Moscow Center, from the week's offerings at McClatchy DC, Cartoon Movement, Go Comics, Politico's Cartoon Gallery, Daryl Cagle's Political Cartoons, About.com, and other fine sources of toony goodness. p3 Picks of the week: Mike Luckovich, Darrin Bell, Tim Eagan, Signe Wilkinson, and Matt Weurker. p3 Legion of Merit: Joel Pett. p3 Certificate of Harmonic Toon Convergence: Marshall Ramsey and Mike Luckovich. p3 Encryption Citation: Joe Heller. The inspiration for this one might have come quickly, but I bet that the actual execution must have taken a good deal more work than usual. Ann Telnaes shares sketches from last week's Democratic National Convention. Mark Fiore asks: When does a wild conspiracy theory stop being a wild conspiracy theory? When just enough evidence floats to the surface to make it sound like a plausible explanation. I'm not there yet, but it does suggest a theme for the general campaign: Trump 2016 – Keel Moose and Squirrel! Tom Tomorrow re-caps the Republican National Convention, a key moment of which is Reince Priebus attack of melancolic nostalgia. Keith Knight presents Biff, doing what you might have thought was impossible. Unless you're Bill O'Reilly. Reuben Bolling brings us the latest edition of Super-Fun-Pak Comix, including the long-awaited (or, shortly anticipated, depending) adventures of Percival Dunwoody, Idiot Time Traveler from 1909. Carol Lay reminds us: it's not all beer and skittles for gods, either. Red Meat's Ted Johnson and Milkman Dan discover that American political discourse isn't broken after all. Fans of the form lost two great talents last week: Richard Thompson, creator of Cul de Sac (he was 58), and Jack Davis, legendary Mad Magazine (and TV Guide cover, and lord knows what all else) artist (he was 91). Brian Fies served up a great two-part appreciation of Thompson at Comic Strip of the Day. And Mad honored its own, joining tributes by – oh hell, by two or three generations of artists who were influenced by his work: Just Google the keywords "jack davis tribute" and duck. One of the best birthday presents I ever got was the CD-ROM collection of every issue of Mad from 1952 to 1998. It's searchable, so I spent this week bingeing on Jack Davis features the way others were bingeing on "Stranger Things." Charlie Redux: Last week the featured animation was "Little Orphan Airedale," the first WB short featuring Charlie Dog (note that, like Smokey Bear, he doesn't have a middle name), directed by Chuck Jones from a Tedd Pierce story in 1947. As I mentioned in passing, that was a reworking of " Porky's Pooch," directed in 1941 by Bob Clampett from a story by Warren Foster. Apart from the obvious differences (character names, Technicolor, etc.) the characters in Clampett's piece seem more like wind-up automatons next to the fully realized characters that Jones created six years later. About the only thing that carries over recognizably is Rover's (Charlie's) line: "You ain't got no dog, and I ain't got no master." 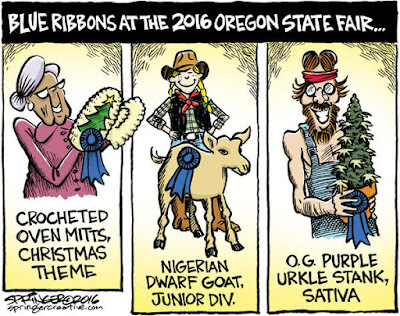 Ex-Oregonian Jack Ohman gets what we could hope to be the final word on the Bernie dead-enders. I tried to make a glass ceiling/glass wall joke out of this, but finally gave up. Documented Ex-Oregonian Jen Sorensen brings it home for something we've often said around here at p3: When it comes to risk assessment, Americans are the worst. Matt Bors submits this item for your approval. Jesse Springer predicts high times at the 2016 Oregon State Fair. Test your toon-captioning super powers at The New Yorker's weekly caption-the-cartoon contest. (Rules here.) And you can browse The New Yorker's cartoon gallery here.